Free Ap Milky is the best FREE Shopify theme that is fully responsive design to make your site fit any devices. 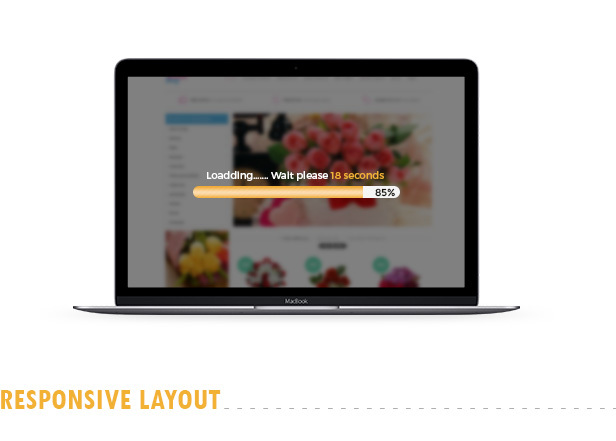 Its flexible layout system helps you build and display content the ways you want. Ap Milk is a great choice for milk store, freshmarket store, clothing store and multi-purpose stores. 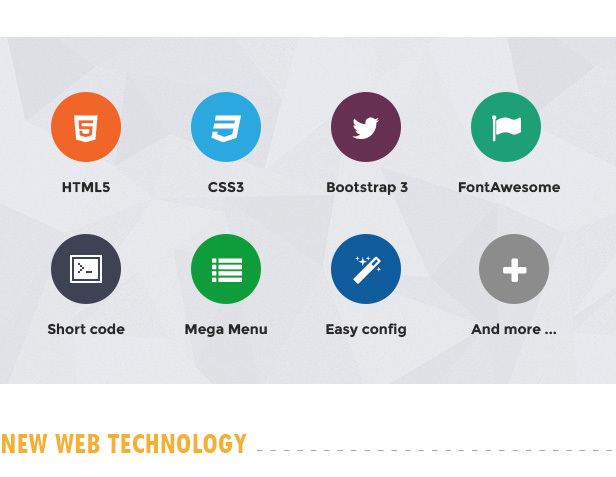 The theme is built with Ap Framework Shopify – new web technologies: Bootstrap 3, Font Awesome 4, CSS3, HTML5, Google Fonts and Shortcodes. This gives you power to create any thing for your site, make it to be the lead in your field. Free Ap Milky is SEO optimized that makes your site friendly with Search engines and help you to implement online marketing effectively. The CSS + JS compression will improve your site performance significantly. You will have chance to enjoy the best Shopify Theme control panel with all core feature built-in and its intuitive Back-end to make your store configuration and customization easier than ever. 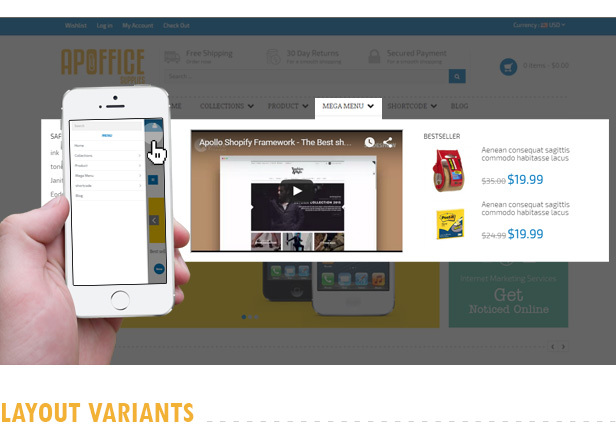 AP Office is a clean, creative and responsive shopify template and it is total free. This template is a modern responsive shopify theme which is suitable for any e-commerce sites about equipment’s product. It was designed for fashion site but can be easily modified to adapt to other fields .It will be a great solution for online Equipment Shop , Printer Store , Office Supplies Shop, Clothing Shop, Bag shop,Shoes shop, Accessories Fashion Shop, Sport Store,Hi-tech Shop, Computer Shop, mobile Shop and more. 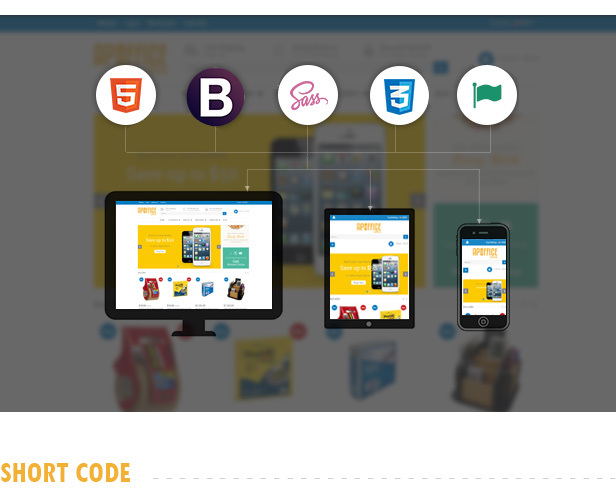 This great theme is powered with AP Framework, one of the best Shopify framework. It is responsive and supports both CSS3 and HTML5 that help to create refined web pages with semantic accuracy. AP Office has bright layout and strict layout at the same time which makes a proper effect on customer. Moreover, slideshow is auto-play with large images, title, description and thumbnail images. Specially, in the middle of homepage, two banners are created to help you can advertising your products or information about discount there. It comes with 2 amazing themes color and flexible layout. With Apollo Control Module let you easy controlling Template Direction, Changing Theme, Template Width via updating few configuration without hacking, customizing code. 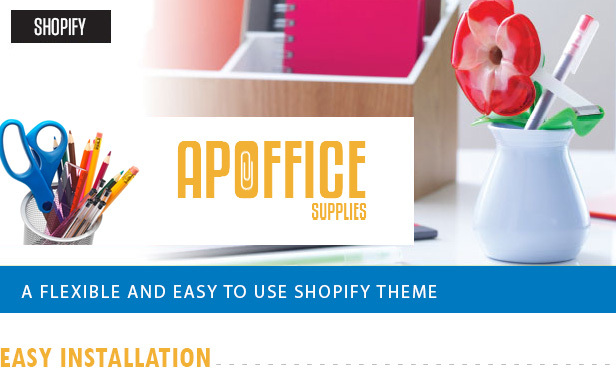 AP Office Responsive Shopify Theme comes with lots of built-in functionalities which include powerful admin panel. 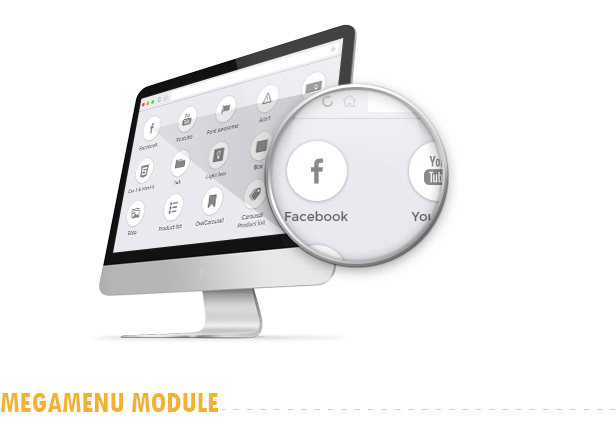 The powerful admin panel will help you manage your site better and make customization easier. Easy 2 minute setup. Quickly install the theme by import theme at backend with one single click of a button. It simply doesn’t get any easier than this. Showing your features product, services slideshow in brilliant way with video, image, text and 100+ animations and effects . It is very simple and very easy to use. Allows you can change the look of your site without any advanced technical knowledge. Access product just 1 click to choose quality, color, share product and see large product. The Ajax Cart extension for Shopify contributes into making your online store convenient for clients. With logical and clearly design structure of blog page, we will help you create professional . Ap Sport Store is a clean , creative and great shopify theme and it is a totally free theme. It is suitable for online Sport Shop, Shoes Store , Sport Instrument shop , Gym Center , Souvenir Shop and more . Ap Sport Store theme is 100% responsive design so it looks great not only in Desktop, but also in Mobile and Tablet. This great theme is powered with Ap Framework, one of the best Shopify framework. It is responsive and supports both CSS3 and HTML5, Shortcode that help to create refined web pages with semantic accuracy. With extensions supported, you can build up a great site without coding. Especially, Ap Sport Store Theme uses AP Framework which includes a powerful admin panel so you can control almost every part of the Shopify theme like: theme direction, changing theme, customizing theme width and more comes with 3 layout modes and 3 amazing themes colors, you can switch the theme colors with one click. To start burning for an exciting summer holiday, Apollotheme is very proud to welcome Ap Windsurfing Shopify theme– one of the most powerful responsive shopify themes. In this summer you are free of charge to own this amazing template. It is totally FREE. It is an ideal theme designed for FASHION shop, BOATING ACCESSORIES store and MARINE service. FREE AP WINDSURFING SHOPIFY THEME is constructed with sublime features that surely you cannot ignore such as: Mega Menu, Quick View Products, Add to cart, Fully Responsive Web Design. It is quite flexible as displaying perfectly on all electronics devices such as: Desktop, Ipad, Iphone, Smartphone,Tablet Android... which creates a consistent look in your sites no matter which devices your customs are using. What’s more! AP WINDSURFING is attractive by a smart effect “sub-product”. It means that when you hover in one banner, a similar minimized banner will appear standby the main products. Thanks to this effect, it is easier for your customers to see various products at the same time. More interestingly, you can easily catch your customers’ sight by colorful background that is suitable with a lively summer holiday. Also, this FREE Shopify theme is very user friendly as visitors have many options to choose the way how your products display in the collection, namely left sidebar grid, right sidebar grid, fullwidth grid, Left sidebar List, Right sidebar list, fullwidth list. Besides, it is powered with built-in functionality as admin panel in order to help you run your store better. Let start your summer with this FREE Shopify theme. FREE AP WOOD is a fully responsive shopify theme that utilizes the latest technologies in Web Development to dynamically adjust for all screen sizes and services. This template meets and fits with furniture store, sofa salon, interior and exterior design. This FREE theme will help you elevate your business to another level through sublime layout and outstanding features. Design is slick and simply that directs visitors’ attention straight to your products. 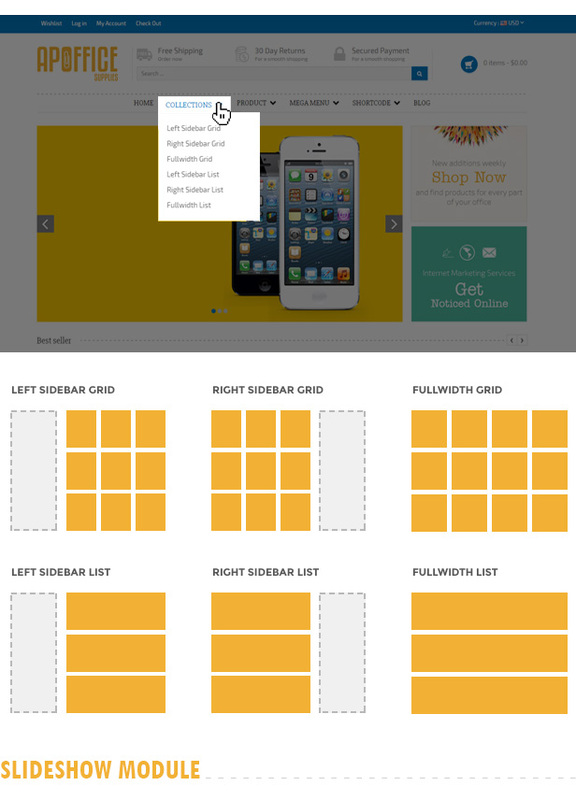 The elegant layout will not only make your products stand out, but will also create an efficient use of screen space. However, the secret is behind Menu button. It can be said that FREE AP WOOD is user friendly theme as all sections such as size, price, and colors are classified eye-catching and visually. Thanks to this classification, customers can choose their products under their preference. Each banner is integrated with versatile visual effects. Wish list, quick view and add to cart are in one dynamic banner which helps your customer more easily make decision and give comparison. Besides, it contributes to build up a professional shop with an awesome look and feel in no time. With mega menu, new arrivals, latest products and special products are displayed clearly.